Life is complicated these days. And if you’re part of the sandwich generation, with a parent 65 or older and either raising a child under 18 or supporting an adult child, then calling life complicated may feel like a ridiculous understatement. But while being squeezed in the middle will never be easy, there are a few steps you can take to manage your financial and emotional risks. Know that you are not alone. Almost one-half of adults in their 40s and 50s fall into the Sandwich Generation, according to the Pew Research Center, with about one-third (32%) of those saying they had given a parent financial support in the past 12 months. A 2014 Families and Work Institute’s Older Adult Caregiver Study of adults found 53 percent to be caring for a relative 65 years of age or older. FWI’s study also notes two-thirds of caregivers are employed while providing elder care. Parents are also increasingly supporting their children financially through college and beyond: 48% of middle-aged adults with grown children gave them financial assistance last year, and 27% were the primary source of cash flow for their kids, according to Pew Research. Women are the majority of individuals in the Sandwich Generation, typically working and caring for young and aging loved ones. The typical woman caught in the middle spends at least 20 hours a week caregiving, which carries with it high costs, personally, financially and professionally. How can you survive the pressure and save for your own financial future while supporting aging parents and your children? Balancing your needs with the needs of your family’s is a task that may pull you in different directions. 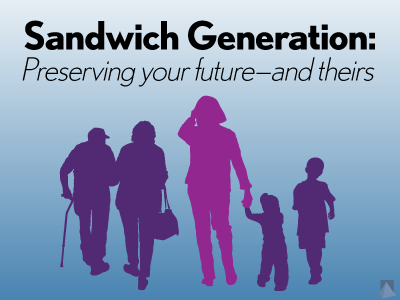 To live the sandwich life, you need to think proactively and create a plan that provides for sharing the burden of care with the next generation as well as understanding options for aging loved ones. Preserve your retirement assets. It may be tempting to reduce retirement savings to pay for your child’s college tuition or with your own parent’s ongoing expenses, but by doing so, you are sacrificing your own future. You may need to adjust your spending habits and your future plans. A financial advisor can make recommendations on how best to move forward and help you to create a realistic plan. For example, if you have young children, contributing to a 529 college savings plan[i] may be recommended to help offset future costs. When a parent begins showing the “warning signs” of dementia in the 3-5 years before diagnosis, many bad mistakes occur in handling finances. This can be a large financial burden to the rest of the family. Understanding the early warning signs of dementia, creating a family culture of communication around the aging process and future care plans, working with your loved one to get their finances in order, and understanding different housing options for the aging will be key when creating your plan. Enjoying a balanced life may seem a distant hope for the future when you are currently living the sandwich life. As a caregiver to an elderly family member, it can be easy to skip your own wellness check-ups to take your mom or dad to their own doctor’s appointments. Don’t forget to take of yourself. To relieve the stress of caregiving, take moments for yourself. It could be as simple as going for a walk or taking a few deep breaths while sitting with a cup of tea. Consistent yoga and mindfulness practice may also help ease your stress. The important thing is to find something that works for you and your life. You and your family do not have to do this alone. Having professionals and friends that you can rely on will help you navigate the complexities of your sandwich life. If you haven’t already, you’ll want to consider working with a financial adviser for everything from retirement to college planning. (You can ask a trusted friend for a referral, but if you’re lacking a recommendation or want to check further, consider working with an adviser who has the CFP® — or Certified Financial Planner — designation, since it is considered a high standard in the industry). Every team will be unique because every family and situation are different and varied support can help in meaningful ways. It can be hard to prioritize your time, your money, and your family with the increased responsibilities that you are facing. Keep up the communication with your immediate family and make sure they understand what is going on. If you feel squeezed right now, check in with professionals to discuss your best course of action in managing your resources and your priorities. Your family situation may be complicated, but that doesn’t mean there isn’t help for your challenges. [i] Prior to investing in a 529 Plan investors should consider whether the investor's or designated beneficiary's home state offers any tax or other benefits that are only available for investments in such state's qualified tuition program. Withdrawals used for qualified expenses are federally tax free. Tax treatment at the state level may vary. Please consult with your tax advisor before investing.